I am providing you with a list of products that are useful in the kitchen with links to where you can buy them online. Click on the product name to visit the website where you can buy them. These are few of my recommendations. Buy only the ones you require and slowly build up for Nutritional Kitchen. Excellent for making homemade sweet potato or potato masala fries that is home made and super delicious. I also make grilled vegetables with spices, lightly roast spiced nuts and seeds and make kale chips. 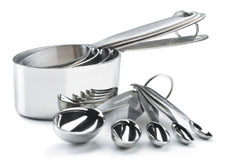 These are essential kitchen tools for measuring grains, beans, spices, herbs and ideal for baking. For baking, roasting etc. A great substitute for aluminum free baking paper. To make flatbread/chapati/roti/tortilla. Wooden is ideal. To make flatbread/chapati/roti/tortilla. 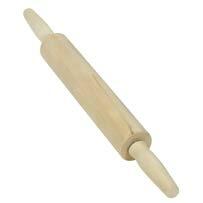 I love wooden rolling pins. To protect my clothes from any stains from food. Get kitchen towels made from cotton. They reduce waste (use instead of paper towels) and you can use them for drying kitchen utensils. I need my gloves in the kitchen to prevent from burning my hands. I use them to hold pots and pans while cooking or when I transfer the cooked food from the pot into a dish. A small cast iron skillet will be ideal for Indian breads, also known as chapati and roasting spices for spices blends and tempering. Various sized pots for cooking soups, beans, vegetables and grains. Look for stainless steel cookware. Chinese woks are ideal for low oil cooking. You can use vegetable broth to cook assorted vegetarian dishes. Make sure you have separate chopping boards for meat and vegetables if you are not a vegetarian. 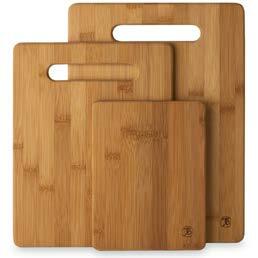 Buy wooden cutting board for vegetables. Good quality stainless steel or ceramic knives for your kitchen. A good peeler is a time-saver in your kitchen. Get a good quality one that will last you long. A kitchen multi tasker that can be used to drain water, sift through flours and spices. Get 2-3 different types of wooden spoons for stirring when cooking. Stainless steel grater for grating vegetables for raita or kofta. 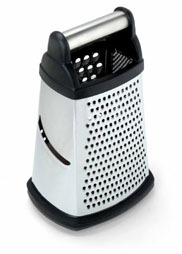 Grater can also be used for grating cheese. This is essential for making homemade paneer or farm cheese. This also comes in handy when straining ghee. Straining and cleaning vegetables. Look for stainless steel ones. For serving soups and dals. You will be using lemon juice almost every day. If you get a juicer then you can juice lot of them together and keep it in your fridge. Get 2-3 different sizes mixing bowls. These are essential for soaking nuts, seeds, grains and beans. They also come in handy for making quick salads. Look for stainless steel mixing bowls. I cannot do without mine. Nut milk bags are useful in making dairy free milk substitutes such as almond milk, cashew milk and/or hemp milk. Nut milk bags are also useful when sprouting. Wooden or stainless steel varieties are the best. This comes handy when making vegetarian kofta’s/kabebs or when deep frying. Ideal for sprouting beans and lentils at home. I make my own mung sprouts at home. A sprouter provides continuous ventilation, humidification and warmth. To extract best flavor, aroma and essential oils from the spices. Stone or wood are recommended. 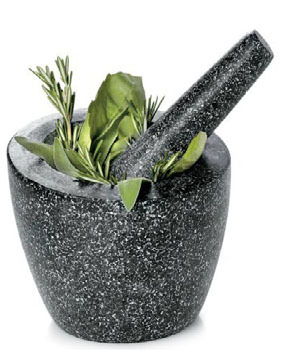 I use mortar and pestle for making onion, ginger or garlic paste. When making alioli or guacamole this tool extracts the best flavours from the ingredients. When you make your own spice mix this will come handy. Until you are completely familiar with the spices and herbs you must label them all to avoid any confusion. A mini grater is amazing to have to grate fresh nutmeg, cinnamon, garlic, ginger, chocolate lemon and lime zest. These ingredients can be directly added to the pot using this grater. 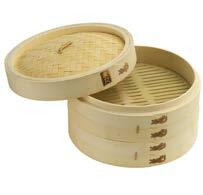 It is round and made from stainless steel. It contains 7 smaller bowls to keep the everyday spices in it. I keep my turmeric, cayenne, cumin, coriander, ajwain, curry leaves and mustard seeds in the masala dabba or spice box. Can be used for quick spice blends or grinding lentils/dals for dosa. All my garam masala, curry powder, hingvastak and digestive spice blends are made in a spice grinder. Another one of my kitchen favourites. Useful to make smooth dals, soups and sauces. From nut milk, sauces, dressing, soups, green juices, green smoothies to ice creams! This is an investment of a lifetime. I recommend Vitamix or Blendtec brand blender or nutribullet. Vitamix, Blendec, Nutribullet Chose the one according to you budget and dietary needs. 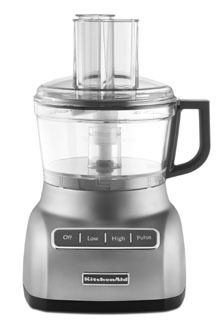 If you buy the high speed blender or nutri bullet you can do away with this kitchen gadget. I use it to make spice paste and chop onions. Different sizes for storing grains, lentils, spices, nut and seeds. Buy glass storage container to store leftovers in your fridge. To pre-organize your meals and keep them in the freezer. I do not recommend consuming tap water at all. I use water filter for water purification. For steaming vegetables. Especially when you are detoxing steamed and low salted vegetables are sattvic. Can dry all fruits, vegetables, and more! Make fruit leathers and vegetable chips easily. Dehydrating is a great way to add a new way of consuming foods without damaging valuable nutrients which may be lost during high heat cooking! Dried foods are a great treat to snack on because they hold almost all of their nutritional value and flavor. You can also use it to make fresh yogurt or coconut yogurt. To make grain free pasta from vegetables this tool is an absolute must.